IMAGE VIA PARENTHOOD ON NBC. So I normally stray away from blogging about TV and media (except as a total sidenote, when I first started blogging, I had a What I'm Watching Wednesday post series where I would talk about movies/TV shows I watched and liked), this is my blog and I'm going to spend an entire blog post chatting about a TV show series ending. Yes, I am that girl. And yes, I DO love Parenthood and will keep on shouting it out forever and always. If you've never watched Parenthood, I'll try and forgive you and then I'll try and force kindly encourage you to get your hands on it. And here I am 6 years later still stuck on the Bravermans. They stuck with me those six years of craziness called college and worklife and here I am learning from them still. I've learned that family is there for you--always. I already knew this, but I loved being able to relate to such an awesomely close-knit family who, well, valued family. I learned that life is to be lived. I learned that I really want kids. And that I think Joel is kinda sorta attractive. And that I want to have a house like Adam and Kristina. And that crying is a-okay. That Amber's character is strong and courageous. That love is real. That I want to be a Braverman. And that I dream of the day when they do a show reunion or spinoff with the grandkids (right, Jess?). But most of all, that time is precious. And that you need to love your family, your friends, and your loved ones and enjoy the time you've got with them. So let's chat about Parenthood, okay? Did you watch the finale? Did you predict everything that happen to happen? Did you like where they took the characters into the future? What are you going to watch on Thursday nights now? And it's okay if you join in if you've never watched it! I haven't watched the finale yet!!! Probably tonight! I've never seen this. I will have to check it out. Parenthood was the only show I was dedicated to watching every week. I loved it! I've been watching since the first season, and it's one of the best. I cried almost every week. I did think it was a sad glimpse into life without Christ. Not to be downer, but as much as I appreciated the themes and the family relationships in the show, it was a real eye-opener for me in terms of how you go through life without the hope of Jesus. But anyway, the finale was amazing! I don't know if we're supposed to say spoilers, so SPOILER ALERT anyone reading comments. I was absolutely shocked they killed Zeek in the last episode. I was sure they were going to end the series with them all sitting around the table eating dinner. Obviously he was going to die soon, but I didn't think it would be part of the finale. I was very pleasantly surprised by the flash-forwards. I loved getting a glimpse of their lives down the road. It was really fun. All in all a wonderful show that I am sad is over! I have seen almost everybody talking about Parenthood this week! I have never watched it before, but after everyone raving about it I think I am going to have to! we have been watching it since we got married! 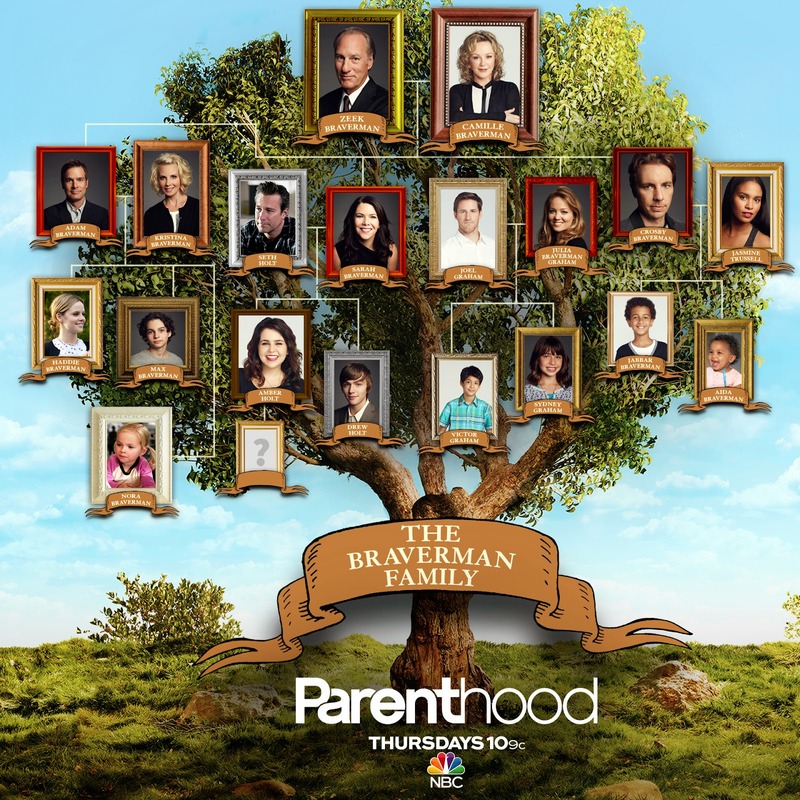 I love the series and we are on Braverman withdrawl as well. I loved the finale but was so sad that Zeek passed (although I knew it was coming). The only thing that was sort of weird was the flash forwards...am I the only one confused by them? Like, did Amber have another kid and got married? Haha they were too fast and I literally couldn't out together in my head the last few scenes. I'm committing to picking up where I left off and watching the rest of the show. I'm going to miss this show! So fun to know that you've loved it all along too! Have you watched it now? It's craaaazy to think it's over! p.s. How did I not remember that you watch(ed) Parenthood? Please do! It's probably my all-time favorite TV show. :) I'm thinking I need to buy all the seasons at some point so I can go back and watch it someday! I am TOTALLY with you. I cry (like how I'm still talking about it present tense?) almost every episode because the events and interactions are just SO real and relateable. I never really thought much about life without Christ in the Bravermans until the last few episodes when Crosby and Adam were upset. It just really hit me, and I love that you mentioned that. It's so true! ...but I actually saw Zeek's passing coming. I had heard rumors online that the writers/creators were going to do something with "the circle of life" and had a feeling that someone might pass away, but I didn't think that they would actually go through with it and actually show it on the show. Do you have any other TV shows that you're going to watch now? Yeah, I think it's pretty much everywhere, haha. It makes it even harder for me to accept that it's over! :) And when you start it, you'll have to let me know. It's such a great show! Haha, well I'll tell you for the millionth time that you should watch it! It's such a good show and totally worth a Netflix date (or two, or three, haha). :) Let me know if/when that happens!! Oh, I knew Zeek would die too. I had read that thing about the circle of life as well. I just was certain they wouldn't have him actually die IN the episode. But I thought they did a good job with it. Other shows I like are Castle (although we're not current with the season on air right now), Parks & Rec, and New Girl. Although there isn't another show I'm dedicated to watching every week. Wahhhhhhhhh. I cried through the entire final episode. Haha. It was uber emotional and i'm going to miss it so much! I started it two days ago and I am HOOKED. I have been binging on it any chance I get. Ugh I can't get enough of it! YESSSS. So glad you're hooked! Honestly, you have no idea how excited I was to hear that you're hooked. :) I'm thinking I need to buy all the seasons so I can binge-watch it again sometime! Yeah, I had no idea he would die IN the episode as well, and I really didn't think that they'd show it! But I agree, they did do a good job with it! Me, too! The only good thing that's come out of it ending is hearing from all my fellow bloggers who shared my love for the Bravermans! Oh my gosh, I did and semi-live tweeted the last 10 minutes when I couldn't stop crying haha. One of my favorite shows!! I loved the little flash-forwards at the end, and I usually find that stuff completely cheesy. I especially liked seeing that Joel and Julia had another baby, and that Ryan was in Zeke's life. :) What were your favorite flash-forwards?? Well it's wonderful to hear from you :)! Let me know if you happen to have any lunch hours free, it'd still be fun to catch up! Parenthood is definitely my favorite show! :) Do you have any other faves you'd recommend I start watching? Haha yes, I was so annoyed when they first separated!! I'm assuming if Parenthood is your favorite show, you've also watched Friday Night Lights, but if not, I definitely recommend it. :) Other than that, I mostly watch crime shows (SVU, Criminal Minds, Stalker, etc. ); Parenthood was the lone drama for me! Haha, you know it! From the moment I heard that Parenthood was ending I knew that a post dedicated to the Bravermans was a must. And I'm thinking you should totally write a post of your own! Can't have enough of them, right? p.s. Have you seen Friday Night Lights? Another blogger recommended I start it and it was created by the same creators of Parenthood!